COMMENTARY — Football is a game of inches, and every play matters. A play here and a play there soon add up and cumulatively can make a world of difference in the outcome of the game. For example, let’s take a look at a few key plays in each of USC’s scoring drives last Saturday. On the Trojans opening drive, Utah barely missed sacking Cody Kessler on a third down play that would have forced USC to punt. Instead, Kessler completed the pass, converted the third down, kept the drive alive and the Trojans ultimately scored a touchdown. USC’s second touchdown was set up by an interception return to the Utes’ 4-yard line. The defense still stood stout, forcing the Trojans to use all four downs before finally punching it across the goal line. Gionni Paul dove and barely missed intercepting a tipped pass in the red zone. But without the score-saving interception, USC ran for a touchdown on the very next play. The Trojans took another interception all the way to the house for their fourth touchdown of the night. USC’s fifth touchdown was perhaps the most frustrating: First, Utah had stopped the Trojans on third down and USC would have been forced to punt, but a 15-yard penalty for defensive hands to the face kept the drive alive. Two plays later, the Utes forced a fumble and appeared to recover it, but a Trojan wrestled the ball back at the bottom of the pile. And finally, USC was able to convert on fourth-and-goal for the second time in the game. The Trojans sixth and final touchdown was the only drive in which Utah did not shoot itself in the foot with a mistake (perhaps because the defense was just too tired to make a mistake after having been on the field for most of the game). It is simply unrealistic to expect any team to play a perfect game and I am not faulting the Utes for making a mistake here and there (after all, people who live in glass houses shouldn’t be throwing stones. But it is not too difficult to imagine a different outcome to last weekend’s contest if a play here and a play there had gone differently. That’s why they play the game, and that’s why sports captivates our attention so — anything can happen, and often does. I’m actually encouraged by the fact that Utah’s woes were largely self-inflicted — that means the problems can be corrected. In fact, I’m betting that the Utes have such a bad taste in their mouth from last Saturday’s loss that they are going to be very motivated to make sure that doesn’t happen again this season. 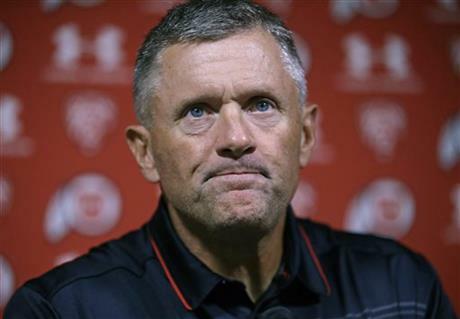 It is hard to imagine that just one short year ago Utah athletic director Dr. Chris Hill had such little faith in head coach Kyle Whittingham and his staff that Dr. Hill declined to renew the contracts for the assistant coaching staff, setting up a scenario in which the entire crew, Whittingham included, could be replaced in one fell swoop after the season if need be. After a 9-4 season, Whittingham not only secured his job as head coach, but was given a further extension in order to erase any lingering doubts. I guess if Whittingham is not going to speculate on speculation, then neither should I. Getting back to the task at hand, while the loss to USC was indeed a gut punch for the Utes, it was hardly the end of the world, or even the season. Utah still controls its own destiny with only a single conference loss, while every other Pac-12 South Division team has at least two conference losses. If the Utes can win out, then Utah will still represent the South in the Pac-12 Championship Game on Saturday, Dec. 5, at Levi’s Stadium in Santa Clara (most likely playing Stanford, which is currently dominating the North Division). A one-loss Pac-12 Champion will still be a serious contender for the four-team national playoff, and even if the Utes are conference runners-up to Stanford, then a berth in the Rose Bowl would still be a great consolation prize. So chin up Ute Nation, all is not lost. If anyone is disappointed that Utah is 6-1 and ranked 13th in the nation at this point in the season, then I pity your children and the unrealistic expectations you have inevitably heaped upon their heads as well. I agree. We’re disappointed, but not discouraged. Saddened, but not sad. Bent (a little), but definitely not broken. There’s a lot of football left to play. Here’s hoping the Utes can get back on track this week as they host Oregon State on The Hill Saturday night with a 5 p.m. kickoff on the Pac-12 Network.